Please contact me via email at prettylittlepaperlove@gmail.com and let me know your mailing address! Day 8 of the Bunny Hop! We made it! Today is the last and final day of the bunny hop! Today I have a few cards to share! The first one I created, I promise really did start out to be a springy card, but almost ended up looking a little valentine's dayish! So no picking on me :) I am not a card maker, but I tried! LOL! I love him! He's so cute! My next card is my attempt at a magnolia card! 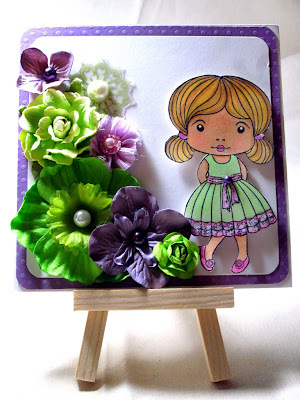 It's a La La Girl stamp (I think) and then a cluster of coordinating flowers!! Thank you for hopping along! 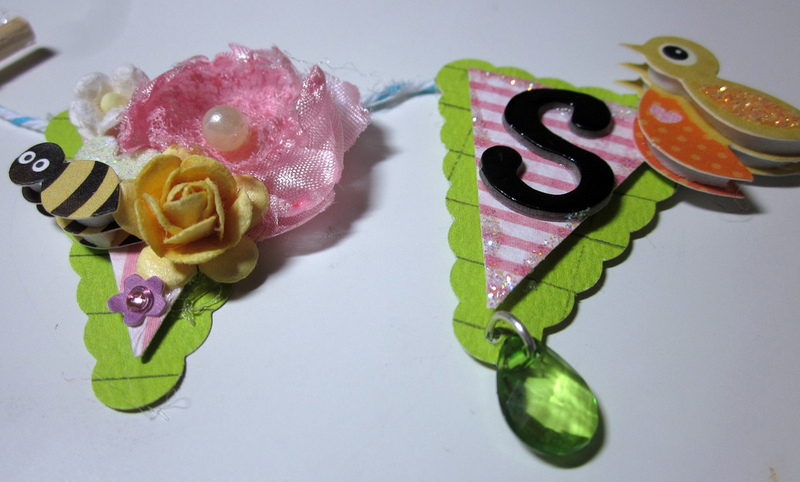 Please follow me & leave a comment if you'd like the chance to win the pink/green tag! Please get all comments in by Monday night! You have up to 8 chances to win! I'll most likely toss some goodies in with the tag as well!!! Make sure you stop by and visit all my friend's blogs as well to see some awesome projects!!!!!!! Hello! Welcome to day 7 of our Spring/Easter blog hop! I hope everyone is having a great weekend so far! I've actually got to work today, boo! But tonight we are going to dye eggs and have some fun family time! 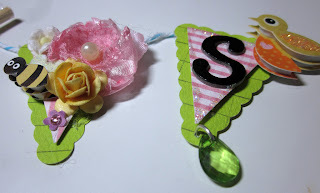 Today I have for you another tag that I made! 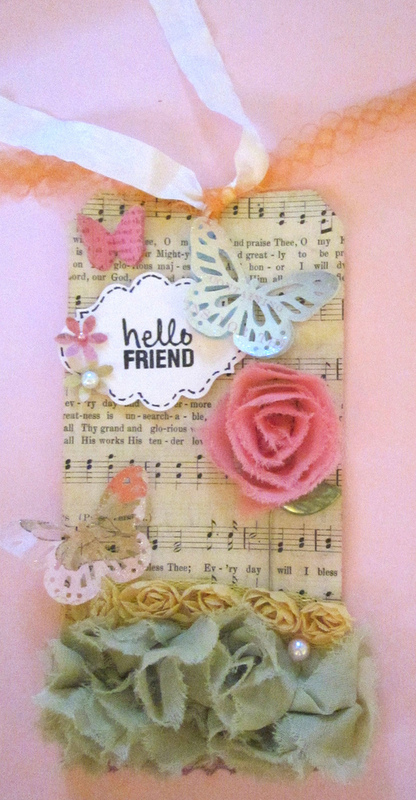 I backed the tag with vintage hymnal paper that I snagged from my dear friend amy. 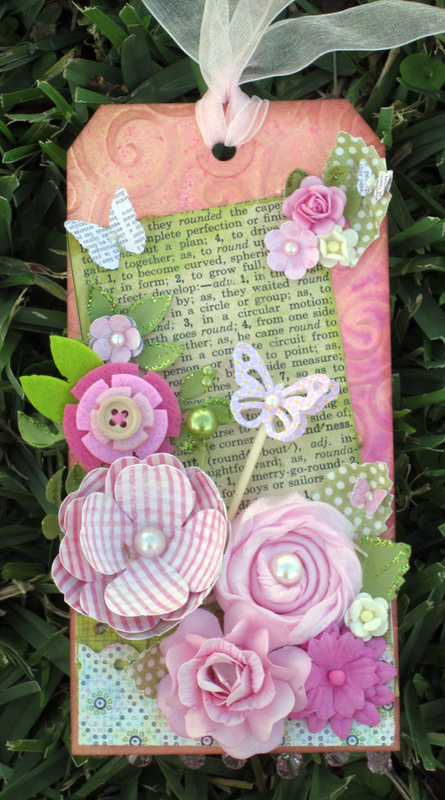 The grass I created using webster's pages bloomers! It is very springy! Thanks again for hopping along with us!!! Day Six of the Bunny Hop! Hello and welcome to day 6 of the bunny hop!! Thank you all who have been hopping along from the beginning!! 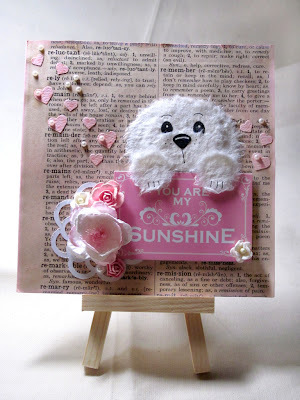 Today I have to share with you all is a little wall hanging that I made using products from Precocious Paper! I'm on the design team over there, and her products are just awesome! Hello there! Welcome to day 5 of the bunny hop! Don't you agree there have been some fabulous projects! 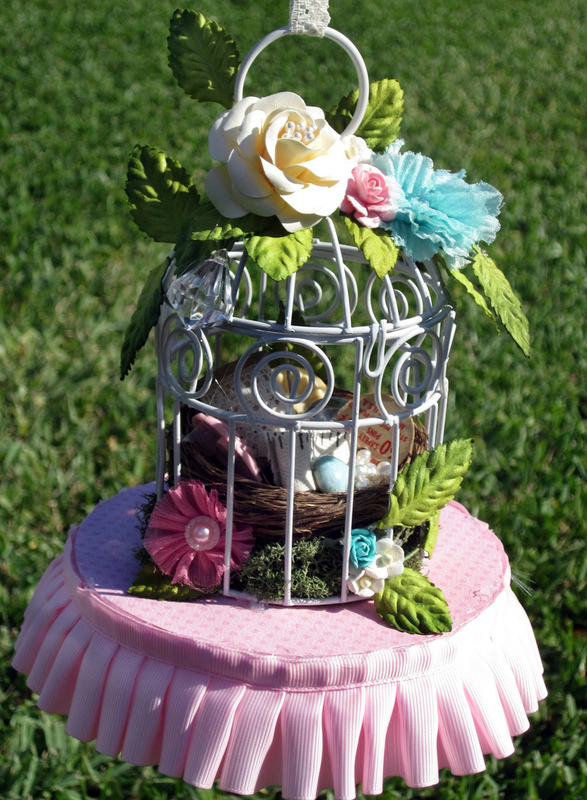 Today I have to share with you an altered birdcage that I made :) The birdcage I picked up in the $1 area at Michaels last year and have been waiting for the perfect idea. How fun did this turn out?! I made the picture bigger than the page so you can see all the fun detail involved! You can click on it as well to make it bigger. I used moss to pad the bottom of the cage, then used a Melissa Frances nest and filled it with vintage sewing items. I then wired up the prima leaves to some floral wire, that stuff is the best, the cloth wrapped wire. It makes being able to make the branches perfect when working with something altered. The flowers are prime, except the beautiful white rose which is a More Paper Than Shoes flower. I made the base with the ruffle to make it stand out more when I hang it in my craftroom. I hope you are enjoying all my projects and I'll be busy today making the last 3 days items! :) Any suggestions then let me know if there is something you'd like to see made! Day Four of the Bunny Hop! Welcome to day Four of the Bunny Hop!!! I hope you are enjoying all the awesome projects that are being posted! Today I have to share with you a tag that I made for a tag swap that I participate in. 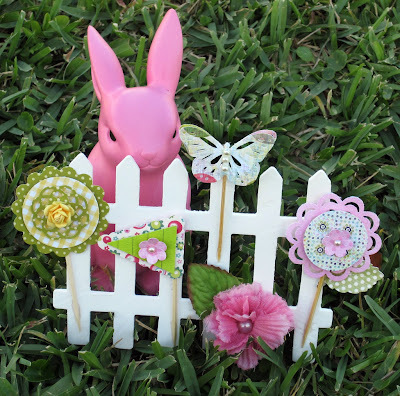 It's very springy feeling, and cute! It's a large tag that I embossed and misted in just about everything! LOL! I started with the lindy's stamp gang, then used glimmer mist, and then mr. hueys and finally the fireworks! Note to self, next time ink white and adhere to tag, apparently the tag has a finish on it. DUH! Day Three of the Bunny Hop! Hello!! Welcome to day three of the bunny hop blog hop!! Today I have something really cute and fun that I made to share with you all! Liz had this punch from Stamping Up that I just HAD to have! So I had her order me one! Here it is so you can see the awesomeness I'm talking about! So I've been itching to make a little banner!! 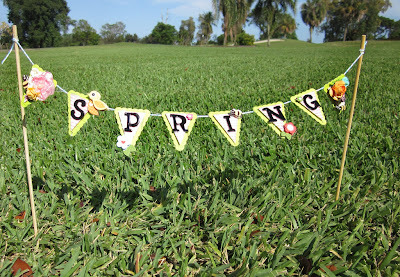 So debuting my new pennant punch, here's my fun spring mini-mini banner! You'll have to open up the image to see just how cute it really is!! My daugther did a great job of setting it up for me out back! The stickers are actually K&CO Valentine's stickers, but they work! 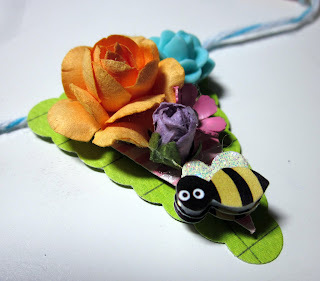 I love the little bee's with the flowers! It's so cute and mini!! perfect to decorate your office or cubical! Here's a bit more of a close up! My daughter also had a great idea, now I need to get to Michaels! We were trying to think of how we could display the little banner on our table and she thought it would be cute to get flower pots to stick the sticks in! So now I've got a project for later in the week! Totally hooked on the mini-mini banner!! LOL! Make sure you visit everyone else! And of course leave a comment and follow me for a chance to win one of my projects!!! See you tomorrow!!! Day Two of the Bunny Hop!! 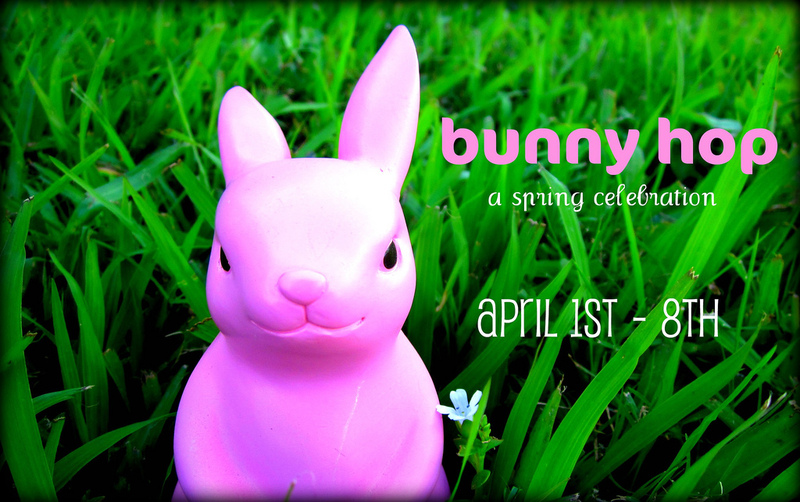 Hello and welcome to day 2 of the bunny hop blog hop! I hope you have enjoyed the projects so far and most importantly are inspired to create something of your own! Here's what I've created for you for day two!! As most of you know I love to make cupcakes! So I have made a collection of Spring cupcake toppers!! Cupcake toppers are a fun way of making cupcakes even more fun! Here is a close up of my favorite one!! I can't wait to make some cupcakes to use these on!! Thank you again for stopping by & I hope to see you tomorrow! Make sure you leave a comment and follow me for a chance to win one of my projects this week! Don't forget to visit everyone else!! Day One of the Bunny Hop! Welcome to day one of the bunny hop! Over the next 8 days five very talented people will be sharing some fun Spring/Easter projects with you!! We all happen to be teachers at the Paper Niche and love sharing our love of all things pretty and paper! 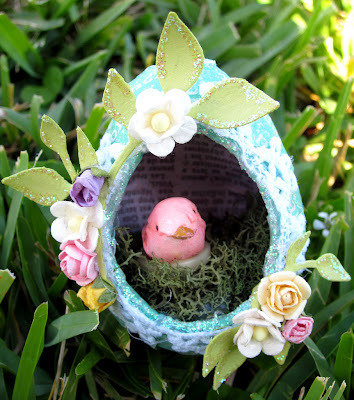 Today I have here to share with you is this little paper mache Easter egg that I altered. If you can ever alter an egg. lol. I cute into my little paper egg to find out that it was infact plastic inside! LOL! I used a blade to cut out the hole. I then used washi tape to cover the egg. From there i kind of took off and just embellished it! I love working small and this was great! The bird originally was white, nothing some glimmer mist can't fix!! Thank you for stopping by! Make sure you leave a comment and follow me if you already don't! I'll be giving away one of my projects this week! You can leave a comment a day! The more visits, the more chances you have!! 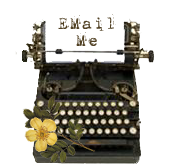 Make sure you stop by and check out these ladies awesome blogs & projects! !